Can 'Modi-army' politics influence 2.5 million ex-servicemen voters? Modi's pro-poor image: Has Congress' NYAY scheme stolen the PM's thunder? With UPA president Sonia Gandhi and sister Priyanka Gandhi Vadra by his side, Congress president Rahul Gandhi Wednesday filed his nomination papers for the Amethi Lok Sabha seat at the Collectorate here. The Congress chief and his family were greeted by party workers, who gathered in the city, despite hot weather conditions, to get a glimpse of their leaders. The three-time MP from Amethi will take on Union Minister and BJP nominee Smriti Irani in the Lok Sabha election in a virtual direct contest as the SP-BSP-RLD alliance in Uttar Pradesh has decided not to field a candidate from the seat. 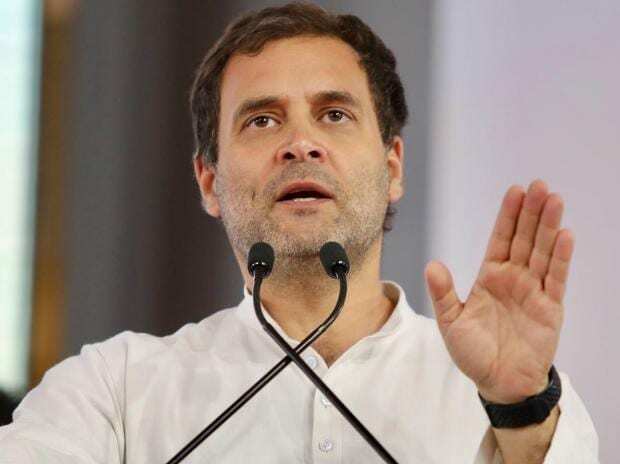 This time, the Congress president is contesting a second seat, Wayanad, in Kerala where he had filed his papers on April 4. Before filing his documents at the Collectorate at Gauriganj, Rahul embarked on a three-km-long roadshow in an open vehicle. On his way, crowds on both sides of the road showered rose petals and marigold flowers on him and cheered for the Congress chief, who waved back at them. Surging crowds of Congress supporters walked along Rahul's vehicle as it made its way to the Collectorate through areas in Munshiganj, Darpipur and Gauriganj. Since morning, Congress supporters, wearing tricolour caps and scarves, were out on the streets holding placards and posters in preparation for their party president's visit. ALSO READ: Can 'Modi-army' politics influence 2.5 million ex-servicemen voters? They raised slogans and often broke into impromptu dance at the beat drums.The streets were lined with Congress flags, and hoardings and posters with pictures of Rahul and party general secretary UP East Priyanka Gandhi. Some banners read 'Vikas ki andhi, Priyanka Gandhi' and 'Amethi ka sansad, desh ka PM'. UPA chairperson Sonia, who was not part of the roadshow, reached the Collectorate to back her son. She will file her nomination papers from neighbouring Rae Bareli Lok Sabha constituency on Thursday. BJP's Smriti Irani is likely to file her nomination papers on Thursday. In the 2014 general elections, Irani was defeated by Rahul by over one lakh votes. Uttar Pradesh Chief Minister Yogi Adityanath is scheduled to hold a roadshow at the same place as Rahul's roadshow and also a public meeting in support of Irani on Thursday. Amethi goes to polls on May 6 in the fifth phase of the Lok Sabha elections.